There is of course only one real Balaké, and that's Amadou Traoré dit Balaké. 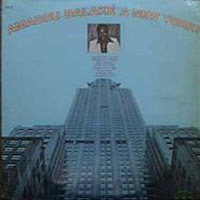 To my surprise I have not seen a posting of perhaps his most 'appealing' album: "Amadou Balaké à New York" from 1979. And by "appealing" I mean to western audiences. This album has it all: a good variety of styles, covers of famous songs, a dose of humour, a splashing of dramatics. It starts with a brilliant follow-up to Balaké's very succesful "Whisky Magnin". This time the topic is not drink but drugs. "Yamba" translates as "happiness", but in this case it is the nickname for "ndaay" (or "daaj") or marijuana. "I can't eat without yamba, I can no longer sleep without yamba, I can no longer work without yamba, I can't talk without yamba". Despite the wordplay with yamba/happiness the tone is more serious than in "Whisky Magnin". Balaké mocks and attacks the young and strong "capable of achieving things for the progress of Africa" for their dependency of the drug. 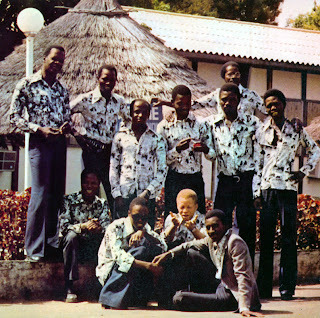 The second track, "They Loule", has some remarkable similarities with the track "4V" by Les Ambassadeurs Internationaux (posted here and here), which was also recorded in Abidjan, but a year earlier. My guess is that both songs have the same source. The greatest mystery in the third track, "Ligida Ranba", is in the title (which may suggest that we are dealing with a version of the B-side of CVD 46). Marketing-wise I can't see the purpose of trying to hide that this is a version of the Cuban classic "El Manisero". But one can rely on Balaké to give even this ultimate example of world music his own authentic Balaké flavouring. The B-side of the album opens with a dramatic 'slow' "Yele". Inimitably Balaké, shouting, almost roaring, with his ever-present sense for the anecdotal detail. This is followed by a track in which I suppose you will have some problems recognising the Horoya Band's hit (from Discothèque 74 - SLP 48) "Sasilon". Nevertheless it is a - admittedly cleverly disguised - version, covered in a thick and creamy Balaké sauce (or maybe I should write "salsa"). The last track, "Awa Yiriga", seems to be a reference to songs of the (at that moment not too distant) past. Songs like the ones on the "Taximen" and "Super Bara Kono Mousso" albums of just a year before. Personally I find this my least favourite track, as the arrangment just does not seem to fit with the song. The recording and the wonderful photo were made by Rob Lokin. EDIT: April 3, 2010: As Aduna (see comments) correctly points out, the titles of two tracks appear to have been switched. The version of "El Manisero" is called "Awa Yiriga", and the last track should be "Ligida Ranba" (and it still doesn't sound like "Ligida Remba" from CVD 46...). 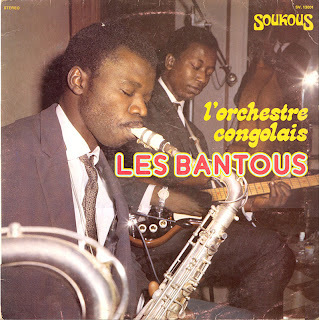 I have trying very hard to get an accurate dating for this lp by Les Bantous. This dating may be of interest for historians for two reasons. I have been assured that this is the first record by a Congolese (and in this case of the Brazzaville side of the river) artist released in stereo. And secondly, it appears to be one of the first uses of the word "soukous" in combination with Congolese music. I estimate this record to be from either 1964 or 1965. It was recorded in Paris, with the aid of Gilles Sala, who has played a crucial role in the development and popularity of African and particularly Congolese music. It remains a mystery to me that so little can be found about this man and his part in the 'rise' of African music. His name keeps popping up, whether in the context of African Jazz (someone even told me that he was instrumental in linking Roger Izeidi, and through Izeidi not only African Jazz but also OK Jazz, with Fonior) or Ry-Co Jazz, or G.G. Vikey, or Malian stars like Fanta Damba and Sory Bamba. In this case I strongly suspect that he may be responsible for the name "Soukous", which was a label of the French record company Vogue. So it may well be that Gilles Sala was the 'inventor' of soukous music (there you go: I've said it*). Let's get back to the dating. Jean-Serge Essous was still in charge. He gradually got involved with other matters (Ry-Co Jazz, African Team) in and from 1965. 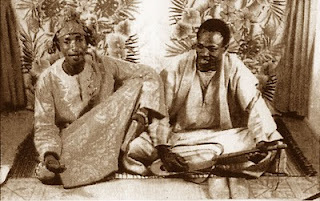 In 1966 Bantous played at the Premier Festival Mondial des Arts Negres in Dakar, and remained in West-Africa for a while before returning to Paris. There are only a limited number of musicians on this album, all from the 'old', early sixties Bantous. So this suggests it was a one-off trip to Paris with just a small team. And there is - as always - the evidence of the music. And don't be fooled by the clear, stereo, sound. There are two songs labelled "twist". This strongly suggests a date in the early to mid-sixties. The 'cha cha' and "guapacha" even would point to an even earlier dating. One thing is obvious, though. This is a very remarkable album, with some great songs, featuring superb artists like Essous and Papa Noel (who are both on the cover). I particularly like Papa Noel's "Paris-Brazza" and Essous' instrumental "Souvenir de Paris". In the spring of 1973 Salif Keita left the Rail Band to join Les Ambassadeurs du Motel. About the move he states (in Florent Mazzoleni's "Salif Keita - La voix du Mandingue): "With the Rail Band I learned nothing, we only played what we heard. Les Ambassadeurs were more experienced: we weren't playing modernised folklore. Les Elephants Noirs* were intellectuals. Arriving at the group I signed an apprenticeship contract to study music. We really played all kinds of music. We were like a real family, I really felt more at ease with Les Ambassadeurs. We rehearsed and studied the songs from 10 a.m. to 2 p.m. and played them the same evening." So Les Ambassadeurs were sophisticated and 'hip', while the Rail Band were a bunch of folk music amateurs. Leader of the hip team was Guinean guitarist Manfila Kanté, who had joined the orchestra a year before Salif, coming from Ivory Coast. He succeeded Malian sax player Moussa 'Vieux' Sissoko as chef d'orchestre. Among the other team members were Tagus Traoré (trumpet) from Guinea and singer Ousmane Dia, a Senegalese who had played with the legendary Star Band. But the majority came from Mali, with organist Idrissa Sumaoro (who will the subject of a future post), rhythm guitarist Amadou Bagayoko (of Amadou & Mariam fame), multi-instrumentalist (flute, balafon, violin) Keletigui Diabaté and singer Beidy Sacko. I am sure I have not mentioned all of the members. In fact, I would like to use this occasion to ask for your help in identifying the members on the photo which was used for both albums released on the Sonafric label in 1977. I realise that not all members of Les Ambassadeurs are in the photo, but I think it would be a good start to at least identify those that are. Starting at the top row: Idrissa Sumaoro. Then, standing, from left to right: Keletigui Diabaté, ?, Ousmane Dia, ?, Sekou Diabaté? (bass player) and Manfila Kanté. Sitting or crouching: Vieux Sissoko, Amadou Bagayoko, Salif Keita, ?. Any suggestion or corrections are welcomed. The two albums released in 1977 were the last of Les Ambassadeurs before they went 'international', i.e. moved from Bamako to Abidjan. In the move they lost one of the key members which is still present in the line-up for this album: organist Idrissa Sumaoro. In the second volume, which I am sharing with you in this post, he is present as an organist in five of the seven tracks, and as a singer in the two tracks composed by Manfila Kanté. Although I am sure many will qualify these tracks as "funky", but in fact both these tracks are somewhat jazzy interpretations of rhythms borrowed from Malian hunters music. Another remarkable presence in this album is Ousmane Dia. 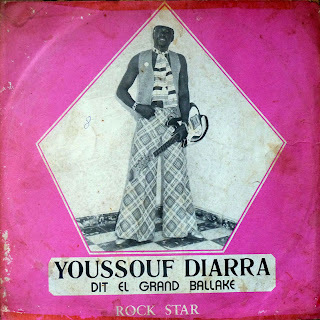 On this volume he 'only' has two tracks (on Volume One he had three), and they may not be as dramatic as the over-the-top "Super Pitié" of Volume One, but they are certainly more Senegalese. But to me, the tracks that make this album into a classic are the three tracks by Salif Keita. The first, "N'na", is a cover of a song made famous by one of Keita's musical heroes, Sory Kandia Kouyaté. Originally a song from the repertoire (like many of the Guinean classics) of Les Ballets Africains, Les Ambassadeurs manage to retain the solemn tone of the original, while adding some typical Ambassadeurs colouring to it. The 'killers' of this album are "Nagana" and "Djoula". Salif is at his best in these tracks which lean heavily on Malian traditional (or 'folkloric') music. In this video recorded by Malian television the Malian line-up is still complete. I am not sure if this means that the recordings were made before their move to Abidjan. This song would suggest the recordings were from a date later than 1978, as it is a cover of "Que Será Lo Que Pelean", a hit from 1978 by Ismael Miranda and the orchestra of Larry Harlow. I assume the lead singer in this song is Beidy Sacko, supported by Ousmane Dia (on the right) and presumably Sambou Diakité on the left. 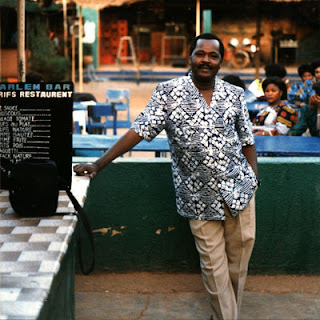 Released in the year of his death these recordings were released as Mbaraka Mwinshehe's last recordings. 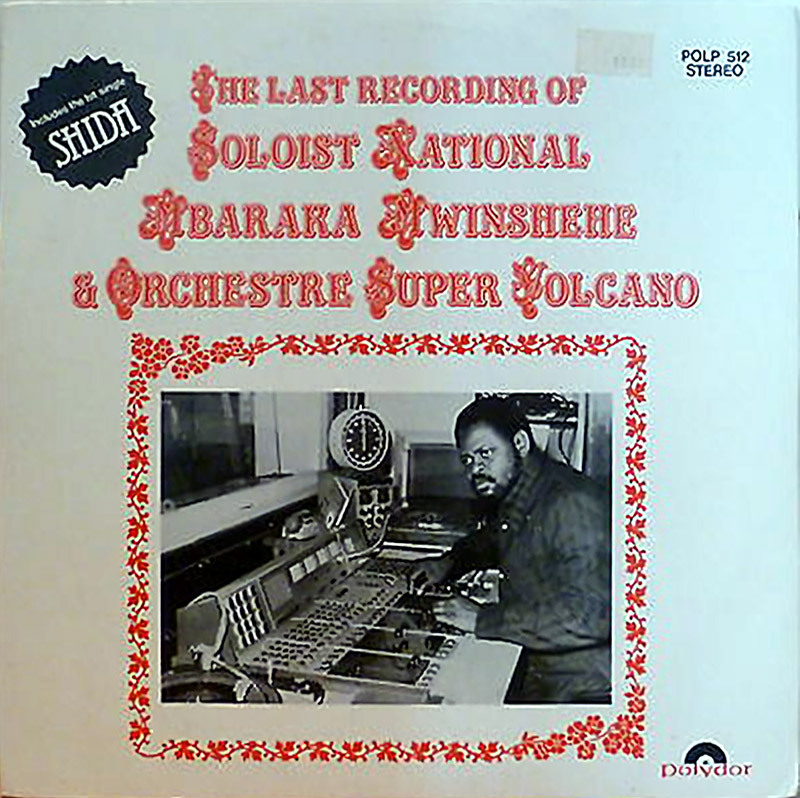 Of course a few years later Polygram Kenya had to spoil it by releasing what they called "The Very Last Recordings". I am guessing this is what we'll see in the next few years with 'the last recordings', 'the very last recordings' and 'recordings he made after his death' by Michael Jackson. But the phenomenon itself should give you an idea of the importance and the standing of the man who was named 'Soloist National'. 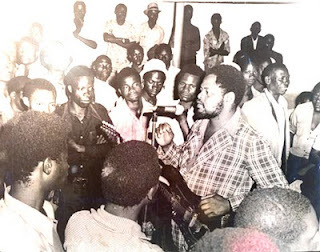 And the nation can be either Kenya, where he worked and recorded, or Tanzania, where he was born and raised and where he took his first steps on the road to musical fame. "I moved today to the seventh street, from the house where I lived before. You could hardly call it a house. I moved, I moved... when I saw it got too much for me. Always neighbours, children and animals annoying me. Always that terrible heat. But now I am finally free of that wailing of cats that kept me awake at night. The children are no longer suffering. Comrades, I don't have words for it. We are crazy with joy! ["wapangaji wa wanazo namii"???] I am no longer cheated by the landlord, thank God! The heat was terrible beneath the palmleaf roof. It is almost a month ago, and meanwhile I have got a pay rise at work. My wife and children no longer have to suffer. All our troubles are over! " Not the kind of thing Michael Jackson would sing about, I suppose. EDIT September 13, 2015: the front sleeve of this album has been found (see below), and I have added this to the audio files (only the first link!! ), which I have upgraded to 320kbps in the process. I'm afraid this post may add some confusion. This Sekouba Diabaté is not from Guinea, like Bambino or Bembeya (a.k.a. 'Diamond Fingers'), but from Mali. Apart from this fact, I know nothing about this artist. Well, that's not really true. I know he has made a wonderful cassette with four beautiful tracks to sooth the nerves of the nervous and relax the stressed, but also to console the worried and lift up the depressed. The ingredients of this cassette are simple: ngoni, guitar, a female chorus and a male singer. The magic is in the execution. I have had this cassette nearly two decades, and its 'posé' rhythms have helped me through some rough patches. "El Gran Ballake started in music in 1967 at the age of 18 with the renowned Jazz de Sissoko orchestra in Acart-ville (Upper Volta). After one year with this orchestra I subsequently changed, and started again with Echo d'El Africa* from Bobo-Dioulasso, and this was in 1968. And already from that time people got an idea of my success in music, for all I did was following musicians around and reworking their songs. On the other hand my parents were against it at all times; and at the end of the day (? ), they gave in, for they realised it was my destiny that guided me on. I loved music to such a point that I started doing research on my own, and often, it even happened that I disappeared into the brousse so I wouldn't be bothered by others from my profession. And at the time the orchestra which accompanied me consisted of some very intelligent and talented young people. So with Echo d'El Africa I released 6 (45 rpms) and 1 (33 rpms) titled "Récite historique de Bobo-Dioulaso" and I remained always the number 1 animateur of this orchestra. At present the orchestra which is accompanying me on my latest lp is Super Saman. I hope the public will listen to the latest lp a lot. The international Diarra Youssouf El Grand Ballake, a.k.a. the Dragon of African song, accompanied by the Tout-Puissant Super Saman." Call me a fool, but after such sleeve notes I can't wait to hear the music. And luckily Youssouf Diarra does not disappoint me. This is a very enjoyable lp in the Malinke style which we know from many Guinean and Malian orchestras. Super Saman misses a horn section, but manages to compensate for this by the freshness and enthusiasm of their guitar section. 'El Grand Ballaké' has nowhere near the vocal presence of Amadou Traoré dit Ballaké, but then, who has? It is really a pity that by the choice of his nickname he has pitted himself against an artist of another, higher league. So forget about the Ballaké bit and listen to this great album, - which by the way is another great find by our friend Faas! *i.e. Echo del Africa National, an album which I hope to post very soon. To some the label "homme orchestre" ("one man orchestra") may conjure up images of great musicians, but I am more inclined to think of rather sad performances in hollow-sounding, wind-ridden underground stations. And I am not suggesting these don't have a certain nostalgic charm. But good music, naaah. 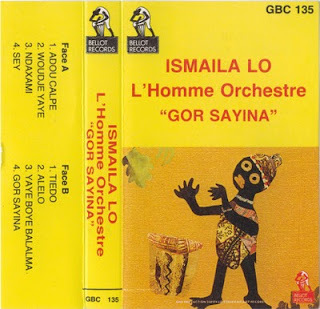 Ismael Lo recorded this cassette in 1981, while he was still playing with Super Diamono. He had been invited to join this band two years earlier, but Ismael's heart was more into Art (he had studied painting). He continued however with Super Diamono until 1984, when he left for Spain to start a career as a painter. One can only assume that this didn't go as well as he expected, because he was soon back recording another album, and has been involved in many more solo projects since. To tell you the truth, I have no patience for his work after this cassette. His later work is too pretentious for my liking. But this cassette still has a certain innocence, which makes it (just) enjoyable. I have had this cassette for years, and there have been periods when I started screaming when I heard it, but - perhaps as a result of the mellowing which comes with age (it does?) - it has fallen into favour again. If you look at my posts so far, you won't be surprised when I tell you I am not very knowledgeable when it comes to Ghanian highlife. But in this case I guess I am in good company. 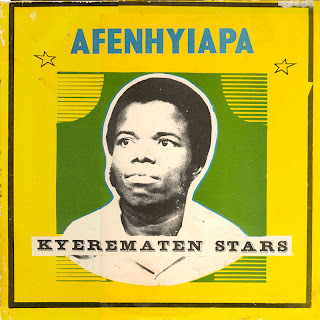 Because even Akwaboa in his great Highlife Haven blog describes the Kyerematen(g) Stars as "quite unknown". I gather from other blogs that there may be some religion involved, of the Christian variety. I haven't been able to detect traces of any religion in this album, but this may be due to my complete and utter ignorance of any of the (highly complicated, - so I am told) languages of Ghana. So my opinion of the lp is solely based on what I can hear. And that is usually a very good measure when evaluating music. Listening to this lp I am not disappointed. This is - in my opinion - a classic highlife album, and one with a distinct Ghanian touch. I am constantly reminded of John Collin's studies into circular rhythms*. If anyone is looking for examples: this album is full of those! *I will see if I can digitise parts of the 1994 documentary 'African Cross Rhythms' of which you can find an excerpt here at some time in the near future.